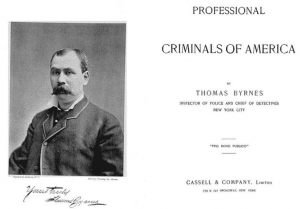 The Professonal Criminals of America Revised website now contains 203 profiles of the most infamous American thieves of the 19th century. Among the finds Kuntz made during the project was the re-discovery of eleven newspaper columns written in 1913 by Max Shinburn, considered one of the foremost safe-crackers of that century. These have now been published in book format, under the title King of Burglars: The Heist Stories of Max Shinburn. Other important finds: the family histories of forger Charles Brockway; con-men Hungry Joe Lewis and Paper-Collar Joe Bond, and burglar Billy Forrester. Links to these and more of the most interesting finds can be found on the “Best of…” page. Jerry Kuntz is a librarian and historical researcher whose interests has focused on people involved in American subcultures from the time period 1850s-1930s, including baseball promoters; Wild West show performers; the dance hall demimonde; early hard-helmet divers; an Amazon orchid collector; and 19th-century professional criminals. Kuntz and his family live in the Hudson Valley. A really interesting journey down the rat holes of 19th century criminal subculture. Bravo on the ferreted-out updates (Aha! Gotcha!) and for making the info. public. A major resource for understanding street-wise lives and the underworld of yesterday. Thank you!